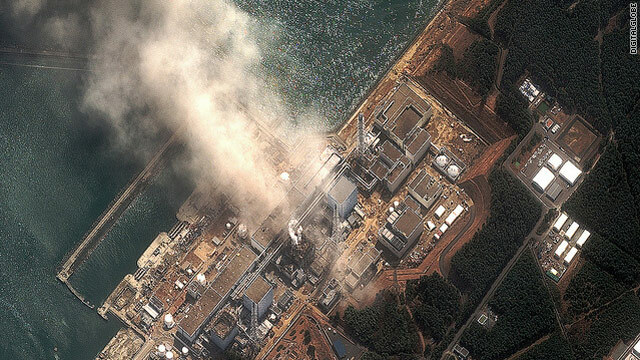 This is a satellite image of the Daiichi Power Plant in Japan taken at 11:04 a.m. local time, just minutes after a reported fire there. An 9.0-magnitude earthquake hit northern Japan early Friday, triggering tsunamis that caused widespread devastation and crippled a nuclear power plant. Are you in an affected area? Send an iReport. Read the full report on the quake, tsunami and the fears surrounding Japan's damaged nuclear reactors. [11:22 p.m. ET Monday, 12:24 p.m. Tuesday in Tokyo] The death toll in Japan from Friday's 9.0-magnitude earthquake and subsequent tsunami has risen to 2,475, authorities said Tuesday. At least 3,118 people were missing and 1,889 injured, according to the National Police Agency Emergency Disaster Headquarters. [10:18 p.m. ET Monday, 11:18 a.m. Tuesday in Tokyo] Radiation levels at the damaged Fukushima Daiichi nuclear power plant have increased to "levels that can impact human health," and anyone within a 30-kilometer radius of the plant should remain indoors, Chief Cabinet Secretary Yukio Edano said Tuesday. Read more on the radiation concerns. [10:12 p.m. ET Monday, 11:12 a.m. Tuesday in Tokyo] A fire has erupted in a fourth reactor at the damaged Fukushima Daiichi nuclear power plant, a top adviser to Japanese Prime Minister Naoto Kan announced Tuesday. [10:07 p.m. ET Monday, 11:07 a.m. Tuesday in Tokyo] The risk of further releases of radioactive material from a damaged nuclear power plant remains "very high," Japanese Prime Minister Naoto Kan said Tuesday. [9:43 p.m. ET Monday, 10:57 a.m. Tuesday in Tokyo] Tokyo Electric Power Co. officials say pressure readings indicate some damage to the Fukushima Daiichi plant No. 2 reactor's suppression pool, a doughnut-shaped reservoir at the base of the reactor containment vessel, A blast was reported there Tuesday morning. Water continues to be injected into "pressure vessels" to cool down radioactive material, even though workers have been evacuated to "safer locations." [8:57 p.m. ET Monday, 9:57 a.m. Tuesday in Tokyo] CNNMoney.com reports that Japanese stocks continued to plummet Tuesday, falling nearly 6% in the first hour of trading, as the nation continues to cope with the aftermath of last week's earthquake. The Nikkei-225 index, the most prominent measure of Tokyo market stocks, dropped 566 points, or 5.9%, within the first 60 minutes of the session. That was on top of a 6.2% drop Monday, the first full trading day after the quake. [8:13 p.m. ET Monday, 9:13 a.m. Tuesday in Tokyo] The death toll in Japan from Friday's 9.0-magnitude earthquake and subsequent tsunami has risen to 2,414, authorities said Tuesday. At least 3,118 people were missing and 1,885 injured, according to the National Police Agency Emergency Disaster Headquarters. The number of dead is expected to go up as rescuers reach more hard-hit areas. [7:47 p.m. ET Monday, 8:47 a.m. Tuesday in Tokyo] Yukio Edano, Japan's chief Cabinet secretary, said he could not rule out the possibility of a meltdown at all three troubled reactors at the Fukushima Daiichi nuclear power plant in northeastern Japan. While sea water was being pumped into the reactors in an effort to prevent further damage, "It cannot necessarily be called a stable situation," Edano said early Tuesday. Kenneth Bergeron, a physicist who used to work at the U.S. Energy Department's Sandia National Laboratories in New Mexico, said that "the release of hydrogen and the fission products (suggests) these reactors have probably had fuel rods exposed for significant periods of time." Edano's comments come amid news about an "explosive impact" that happened Tuesday morning at the No. 2 reactor. Cooling has been a problem for days at reactors No. 1 and 3, because the earthquake and the tsunami damaged those reactors' cooling systems. But cooling problems at No. 2 began Monday, when a blast at the building that contains No. 3 - said to be caused by a buildup of hydrogen - damaged No. 2's cooling system. [7:17 p.m. ET Monday, 8:17 a.m. Tuesday in Tokyo] More information about the new blast at the Fukushima Daiichi nuclear power plant in northeastern Japan: An "explosive impact" occurred Tuesday morning at the No. 2 reactor, a day after a hydrogen explosion rocked reactor No. 3, the plant's owner announced. [7:09 p.m. ET Monday, 8:09 a.m. Tuesday in Tokyo] A blast has been heard at the site of the No. 2 reactor of the Fukushima Daiichi nuclear power plant, according to Japanese broadcaster NHK. [6:44 p.m. ET Monday, 7:44 a.m. Tuesday in Tokyo] The situation with Fukushima Daiichi's No. 2 nuclear reactor is not yet stable, though authorities have had some success in pumping in water in order to cool radioactive material inside, Japan's Chief Cabinet Secretary Yukio Edano said early Tuesday. He said the cooling functions at the facility's Nos. 1 and 3 nuclear reactors are serving their purpose. Cooling problems at the No. 2 reactor on Monday allowed nuclear fuel rods to overheat and generate radioactive steam that officials will have to vent into the atmosphere. Crews thought they had the situation under control, but water levels dropped dangerously again Monday night when a buildup of steam prevented fresh seawater from entering the reactor chamber, Tokyo Electric Power Co. reported. Workers have had trouble keeping reactors No. 1 and No. 3 cool because the earthquake and the tsunami damaged those reactors' cooling systems. But the cooling problems at No. 2 began Monday, when a blast at the building that contains No. 3 - said to be caused by a buildup of hydrogen - damaged No. 2's cooling system. [6:39 p.m. ET Monday, 7:39 a.m. Tuesday in Tokyo] The U.S. Geological Survey has revised the magnitude of Friday's earthquake in Japan upward to 9.0 on Monday. It had previously put the magnitude at 8.9. The new reading means the quake is tied for fourth on the U.S. survey's list of strongest earthquakes since 1900. [6:07 p.m. ET Monday, 7:07 a.m. Tuesday in Tokyo] CNN journalists on the sense of urgency rescuers are feeling to find survivors because of unfavorable weather forecasts, which called for continued temperatures barely above freezing, as well as rain and freezing precipitation that could trigger mudslides. Continued subnormal cold also will probably strain power generation in a country already employing rolling blackouts as a conservation measure. [5:18 p.m. ET Monday, 6:18 a.m. Tuesday in Tokyo] Donations to help Japan have been relatively slow to come, reaching about $12 million so far, according to an early tally by the Chronicle of Philanthropy, a newspaper covering nonprofit organizations. That number is far below the first four-day totals of other recent natural disasters, CNNMoney reports. More than $150 million was raised toward relief within four days of the crisis in Haiti, according to the Chronicle of Philanthropy. In the case of Hurricane Katrina, donations exceeded $108 million during the crucial first four days. "Japan is not Haiti and it's not Indonesia, it's a developed country with a GDP somewhat similar to our country. It's not what people typically think of as a country in need of wide-scale international aid," said Daniel Borochoff, president of the American Institute of Philanthropy. [4:34 p.m. p.m. ET Monday, 5:34 a.m. Tuesday in Tokyo] In the first full trading day following last week's quake, Japan's Nikkei 225 plunged 6.2% Monday. While other world markets were mostly lower, the decline was generally more muted. In Europe, Britain's FTSE 100 ended down less than 1%, while Germany's DAX fell 1.7% and France's CAC 40 lost 1.3%. And there were even gains in Asia - Hong Kong's Hang Seng rose 0.4% Monday, while China's Shanghai Composite edged up 0.1%. This news came as leading investors said that they expect, over the long term, the massive human disaster in Japan is unlikely to have a major impact on economic markets outside that Asian nation. [2:14 p.m. p.m. ET Monday, 3:14 a.m. Tuesday in Tokyo] The United States has sent a team of experts to assist Japan at the Fukushima Daiichi nuclear plant, including two cooling experts. U.S. officials are also "assembling a team of experts that would be dispatched in the near future," Greg Jaczko, chairman of the U.S. Nuclear Regulatory Commission, said. Japan has asked for additional types of equipment that will help provide water and keep the reactors cool, Jaczko said. The nuclear chief added that, based on the reactor design and nature of the accident, there is low probability of harmful radiation reaching the United Sates, including Hawaii and the U.S. territories. [1:48 p.m. p.m. ET Monday, 2:48 a.m. Tuesday in Tokyo] The Japanese government has formally requested the U.S. Nuclear Regulatory Agency's assistance in responding to the situation at its nuclear power plants. [1:25 p.m. p.m. ET Monday, 2:25 a.m. Tuesday in Tokyo] The death toll has risen to 1,897, which doesn't account for thousands of bodies that Japan's Kyodo News reports have been found in the hard-hit Miyagi Prefecture on the northeast coast. The number of dead is expected to go up as rescuers reach more hard-hit areas. At least 3,002 people were missing Monday, the National Police Agency said. Public broadcaster NHK reported that 450,000 people were living in shelters. [12:41 p.m. p.m. ET Monday, 1:41 a.m. Tuesday in Tokyo] For your reference, a microsievert is an international unit measuring radiation dosage. People are typically exposed to about 1,000 microsieverts over the course of a year. [12:05 p.m. ET Monday, 1:05 a.m. Tuesday in Tokyo] When Fukushima Daiichi nuclear plant released steam Monday as part of the effort to solve problems at reactors, radiation levels were found to be twice the maximum levels previously detected, but the levels dropped dramatically as the material dissipated, Tokyo Electric Power Company said. The radiation levels at the front gate of the power plant were found to be 760 microsieverts at 9:35 p.m.; 3,130 microsieverts two minutes later; and 400 microsieverts by 10:15 p.m., TEPCO said. [11:52 a.m. ET Monday, 12:52 a.m. Tuesday in Tokyo] Fuel rods at Fukushima Daiichi's No. 2 nuclear reactor became fully exposed again Monday night, Tokyo Electric Power Co. said. When exposed, the fuel rods emit a great deal of heat, creating the possibility of the core melting. The company said the problem occurred when a valve to release the steam was closed. The heat caused water surrounding the fuel rods to evaporate. The company said it was able to open the valve to fix the problem. [11:42 a.m. ET Monday, 12:42 a.m. Tuesday in Tokyo] The official death toll, rising every few hours, reached 1,886 on Monday. But that didn't account for thousands of bodies Japan's Kyodo News said had been found in the hard-hit Miyagi prefecture on Japan's northeast coast. At least 2,369 people were missing Monday, the National Police Agency said, and the number of dead is expected to go up as rescuers reach more hard-hit areas. [11:08 a.m. ET Monday, 12:08 a.m. Tuesday in Tokyo] Fuel rods in reactor No. 2 at Tokyo Electric Power's Fukushima Daiichi nuclear power plant were fully exposed when a cooling pump ran out of fuel on Monday, the power company said, according to Kyodo News service. Water levels were later restored to cover 30 centimeters of the lower rods, the report said. [10:57 a.m. ET Monday, 11:57 p.m. in Tokyo] Russia's state-owned energy giant will deliver two shipments of liquefied natural gas to Japan, Russian Deputy Prime Minister Igor Sechin announced Monday. Gazprom will send 100,000 tons of gas in April and the same amount again in May, he said. [10:51 a.m. ET Monday, 11:51 p.m. in Tokyo] Japanese officials have said they are operating under the presumption that there may already be partial meltdowns at reactors No. 1 and No. 3 at the Fukushima Daiichi nuclear plant. Authorities have not been able to confirm a meltdown because it is too hot inside the affected reactors to check. With word Monday of a new explosion and possible meltdown in reactor No. 2 at the plant, half of its six reactors may now be seriously damaged. [10:41 a.m. ET Monday, 11:41 p.m. in Tokyo] President Obama reiterated U.S. support for the people of Japan, whom he called "some of our closest friends and allies." "The United States will offer any assistance we can as Japan recovers from multiple disasters," the president said. [10:16 a.m. ET Monday, 11:16 p.m. in Tokyo] Cold weather has increased the hardship for disaster victims and rescuers. Rescuers report some victims have been exposed to cold weather and water, in some cases for days. Conditions are expected to worsen with temperatures forecast to drop below freezing by Wednesday across portions of the earthquake zone. [8:58 a.m. ET Monday, 9:58 p.m. in Tokyo] More than 550,000 quake and tsunami evacuees were in 2,500 evacuation shelters in six prefectures on Monday, Kyodo News service reported. [8:35 a.m. ET Monday, 9:35 p.m. in Tokyo] Tokyo Electric Power Company says a core meltdown might have occurred in the No. 2 nuclear reactor of its Fukushima No. 1 power plant. The company said a pump sending water into the reactor ran low on fuel causing the level of cooling water to drop and exposing fuel rods. Sea water has been pumped into the reactor to stabilize the situation, but the company says a release of radioactive steam my be necessary. [8:28 a.m. ET Monday, 9:28 p.m. in Tokyo] Oil prices fell Monday as the earthquake in Japan raised concerns about the worldwide economy. The price of light crude for April delivery fell $1.53 per barrel to $99.63. "I think it's a reaction to Japan," said Ken Wattret, economist with BNP Paribas in London. "Developments in Japan might have a disruptive affect on economic activity through out the Asia and the world." [7:22 a.m. ET Monday, 8:22 p.m. in Tokyo] Tohoku Electric Co. says there is a fire at its Haramachi thermal plant in quake-damaged Minamisoma, Japan. The utility tells broadcaster NHK that heavy oil leaked from a tank at the facility and ignited. Smoke and flames were visible, NHK reported. [7:04 a.m. ET Monday, 8:04 p.m. in Tokyo] Honda Motor Co. will halt output at all its Japanese factories until Sunday, Kyodo News agency reports. Honda said the move was made necessary by the need for suppliers to resume production and to comply with electricity rationing. Toyota has halted production through Wednesday. The shutdown will affect 40,000 units, the company said. "We are placing priority on making sure that we are supporting the relief efforts in the region affected and ensuring the safety of all our employees," an official, Dion Corbett, said. [6:14 a.m. ET Monday, 7:14 p.m. in Tokyo] Two search-and-rescue teams from the United States arrived in the coastal city of Ofunato, Japan, which was severely damaged in the quake. It took their convoy six hours to travel from Misawa Air Base on Monday. [5:49 a.m. ET Monday, 6:49 p.m. in Tokyo] Rolling blackouts in Japan that began on Monday are expected to last through April, Kyodo News Agency reports. The blackouts will affect 45 million people in Tokyo Electric Power's service area, according to the report. [5:40 a.m. ET Monday, 6:40 p.m. in Tokyo] Accuweather.com reports that rain and snow are in the forecast for Senadai, Japan, and quake-hit regions on Tuesday and Wednesday. High temperatures are expected to be only 36 degrees Fahrenheit (2 degrees Celsius) on Tuesday and 38 degrees Fahrenheit (3 degrees Celsius) on Wednesday. [5:21 a.m. ET Monday, 6:21 p.m. in Tokyo] The death toll from the earthquake and tsunami that hit Japan late last week has risen to 1,833, authorities said Monday. At least 2,369 people were missing and 1,898 injured, according to the National Police Agency Emergency Disaster Headquarters. The number of dead is expected to go up as rescuers reach more hard-hit areas. [5:20 a.m. ET Monday, 6:20 p.m. in Tokyo] Tests detected low levels of radioactivity on 17 U.S. Navy helicopter crew members when they returned to the USS Ronald Reagan after conducting disaster relief missions in Japan, the military said Monday. No further contamination was detected after the crew members washed with soap and water, the Navy said. [5:18 a.m. ET Monday, 6:18 p.m. in Tokyo] New Zealand has sent a rescue team of 10 from Christchurch to the hard-hit Japanese coastal city of Sendai. Christchurch is cleaning up from its own earthquake on February 21 that killed 123 people. [4:45 a.m. ET Monday, 5:45 p.m. in Tokyo] The International Skating Union has announced that the World Figure Skating Championships scheduled for Tokyo later this month will be postponed or canceled. The event was scheduled for March 21 to 27. The ISU World Team Trophy scheduled for Yokohama April 14 to 17 also will not take place during that time, the ISU said. [4:37 a.m. ET Monday, 5:37 p.m. in Tokyo] Tokyo Electric Power Co. said electricity rationing was beginning in some areas as of 5 p.m. Tokyo time Monday, Kyodo News Agency reported. [4:15 a.m. ET Monday, 5:15 p.m. in Tokyo] Japanese stocks were hammered Monday, with the leading Japanese stock index finishing more than 6% lower in investor reaction to last week's massive earthquake, CNNMoney reports. The Nikkei-225 index ended down 634 points, or 6.2%, to 9,620. The index finished near its lows for the day, having dropped more than 675 points before a small recovery. [3:43 a.m. ET Monday, 4:43 p.m. Monday in Tokyo] The U.S. 7th Fleet has temporarily repositioned its ships and planes away from the Fukushima Daiichi nuclear power plant after detecting low level contamination in the air and on its planes in the area, the U.S. Navy said. The ship was operating about 100 miles northeast of the power plant when the "airborne radioactivity" was detected, the Navy said. [3:34 a.m. ET Monday, 4:34 p.m. Monday in Tokyo] Another nuclear reactor at the Fukushima Daiichi plant in northeastern Japan has lost its cooling capabilities, the country's chief Cabinet secretary said Monday. The problem was detected in the plant's No. 2 reactor Monday afternoon, Chief Cabinet Secretary Yukio Edano told reporters. Water levels were falling and pressure was building up inside, he said, and officials were working on a plan to release pressure and also inject seawater into that reactor. Workers have been scrambling to cool down fuel rods at two other reactors at the plant - No. 1 and No. 3 - after an 8.9-magnitude earthquake and ensuing tsunami Friday knocked out the reactors' cooling systems. There are six reactors at Tokyo Electric Power Company's Fukushima Daiichi plant, located about 65 km (40 miles) south of Sendai. [3:25 a.m. ET Monday, 4:25 p.m. Monday in Tokyo] Another nuclear reactor at the Fukushima Daiichi plant in northeastern Japan has lost its cooling capabilities, Kyodo News reported Monday. The problem was detected in the plant's No. 2 reactor Monday, Kyodo said. Public broadcaster NHK said pressure was building up inside. [2:35 a.m. ET Monday, 3:35 p.m. Monday in Tokyo] Japan's central bank announced plans Monday to inject a record 15 trillion yen ($183 billion) into the economy to reassure global investors in the stability of Japanese financial markets and banks. [2:13 a.m. ET Monday, 3:13 p.m. Monday in Tokyo] A massive emergency response operation is underway in northern Japan, with world governments and international aid groups coming together to bring relief to the beleaguered island nation. Sixty-nine governments have offered to help with search and rescue, the United Nations Office for the Coordination of Humanitarian Affairs (OCHA) said. The Japanese government has received 11 Urban Search and Rescue teams (USAR), the group said in a situation report, including teams from the United States, South Korea, Australia, Germany, Mexico, New Zealand, China, Hungary, Singapore and the United Kingdom. [1:36 a.m. ET Monday, 3:36 p.m. Monday in Tokyo] Despite lingering tension between the two countries, a 15-member Chinese rescue team was working Monday at an elementary school in Oofunato, a city in Japan severely damaged by the 8.9-magnitude earthquake. The gesture comes just six months after the two countries sparred in a territorial dispute over the Diaoyu Islands in the East China Sea. For some reason our Leaders in this country,( USA) Have underground shelters, I wonder why? Maybe they know something we don't? So sad its a big Tragedy in century, my request with every person please helped us. Is moving all Americans 50 miles away enough? Its smart not to uproot these people every time the risk goes up. 12 mi, 15mi, 30mi so on and so on. Get them as far away as needed in the worst case scenario to avoid an emergency evacuation! By using this 'Dhup', you can remove all the radiations from your house/street/city. Attractive part of content. I simply stumbled upon your website and in accession capital to claim that I get in fact loved account your weblog posts. Any way I will be subscribing in your feeds and even I achievement you get right of entry to consistently quickly.